Donald “The Art of the Deal” Trump lost—bigly. Despite his threats against Republicans who refused to vote for the American Health Care Act (AHCA), and despite his ultimatum that he was done negotiating and the bill had to be voted on immediately, the Republican leadership of the House of Representatives withdrew the bill yesterday afternoon, and Paul Ryan, Speaker of the House, conceded on national television that Obamacare remains “the law of the land” for the foreseeable future. It had become clear that Trump would fail to get the bill through the Senate, where the Republican majority is slim. But he also failed to get it through the House, where they have a whopping majority. He even failed in his effort to force through a vote of the AHCA, even though it would lose, so that he would have a record of which Republican representatives to persecute for daring to defy him. In the end, he acquiesced to Ryan’s plea that the bill be withdrawn, thereby allowing some Republicans to avoid taking responsibility for depriving their constituents of their health insurance, and others to avoid taking responsibility for passing something less extreme than the total elimination of all features of Obamacare. During his presidential campaign, Trump repeated incessantly that he would repeal Obamacare immediately and replace it with something much better. The nonpartisan Congressional Budget Office estimated that, by 2026, the “much better” AHCA would have deprived 24 million Americans of their healthcare insurance, and a secret-but-leaked document produced by Trump’s White House put the number even higher—26 million. The AHCA would also have reduced benefits, eliminated maternity and emergency-room coverage guarantees, and raised costs for most everyone else. All these “reforms” would have greatly reduced the government’s healthcare spending, and the money saved was slated to be used to roll back Obamacare taxes on the super-rich. 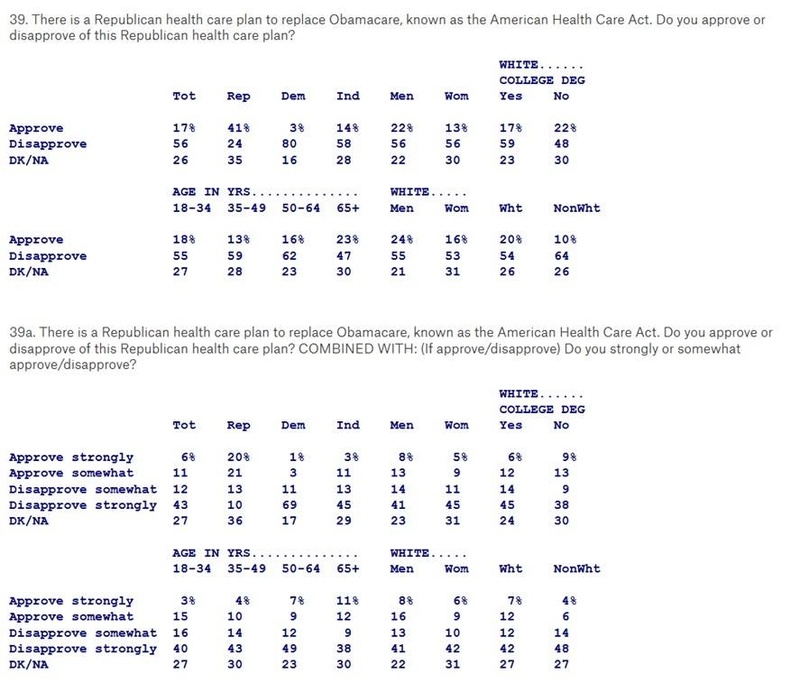 On Thursday, a Quinnipiac University poll found that only 17% of Americans supported the “much better” ACHA, while 56% opposed it. Only 6% strongly approved of it, while 43% strongly disapproved. In their analyses of why TrumpCare went down in flames, most pundits have done no more than tell us that the bill lacked enough votes—the Tea Party’s Congressional faction (the so-called Freedom Caucus) opposed it, as did some more moderate Republican congresspeople whose seats are not “safe.” But why did it lack enough votes? Only MSNBC’s Rachel Maddow, and (perhaps) a few others, have given credit where it belongs—to the anti-Trump Resistance. Last month, members of the Resistance packed “town hall” meetings. These meetings are held by Congresspeople in their districts during Congress’ breaks. 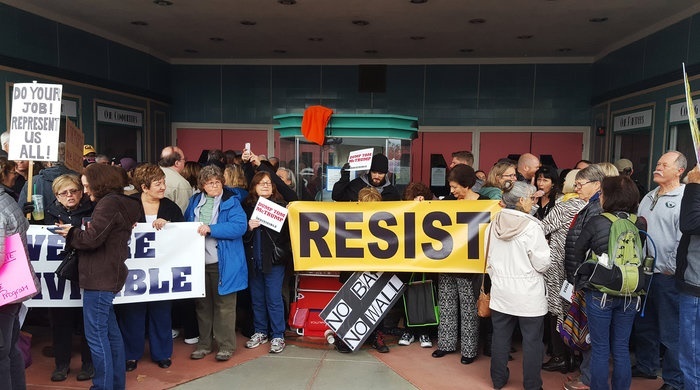 While town halls are typically small and sleepy affairs, this year they were mobbed by angry constituents, with voters– including Republicans protesting Republicans, even in districts that Trump carried overwhelmingly–demanding that their benefits and services not be diminished. A great deal of their wrath was directed against TrumpCare. In town after town throughout the country, they stood up to say that Obamacare saved their lives and the lives of their loved ones (literally), that to remove their coverage is to sentence them to death, and that they would hold their Congresspeople personally accountable. The fightback was so intense that many Republicans cancelled their town hall meetings (whereupon they confronted pickets at their offices and public appearances), or held them via Skype, or abruptly terminated the meetings and fled out the back door. When Congress went back into session and their representatives returned to Washington, the Resistance did not abate. Members of the Resistance flooded their representatives’ offices with phone calls. One Republican reported that the phone calls he received were 1000 to 1 against TrumpCare. It is this Resistance that largely accounts for the refusal of some Republicans to vote for TrumpCare—both the refusal of some relatively moderate Republicans and the refusal coming from the “Freedom Caucus.” The size and depth of the Resistance made clear to the relative moderates that they were in danger of losing their seats if they voted for the bill. It also caused the Republican mainstream to compromise. They retained some features of Obamacare in their replacement bill, resulting in a melange that the “Freedom Caucus” correctly dubbed “Obamacare-lite.” The concessions to the opposition coming from below are what caused the “Freedom Caucus” to oppose the TrumpCare bill. The defeat of TrumpCare, like the Resistance as a whole, is a stinging rebuke to the pro-Trump and soft-on-Trump “left.” In its desperate efforts to collaborate with Trumpism, in order to forge a red-brown alliance and gain a hearing among Trump’s white-nationalist base, the pro-Trump and soft-on-Trump “left” has portrayed Trumpism as “populism” and Trump as a tribune of the “white working class.” The Resistance hasn’t bought any of that, and it has crushed TrumpCare—on its own, without the assistance of the so-called advanced consciousness that the pro-Trump and soft-on-Trump “left” wants to impose on it. Now is the time for the Resistance to build on its victories, and kick its enemies while they are down. Let us make no mistake. Trump has not given up, and he is, as always, vengeful. 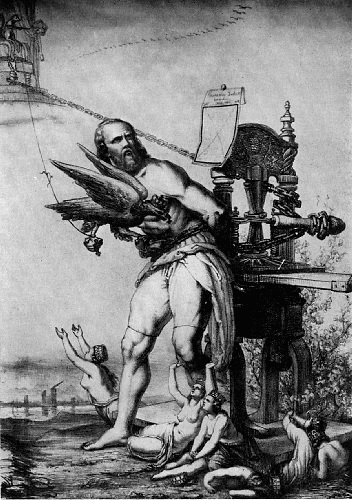 He intends, as he always vows, to hit back ten times as hard. This struggle will not be won until the Resistance has the power to invite Trump to come out of the White House and speak with it—on his knees, with his hands in the air. 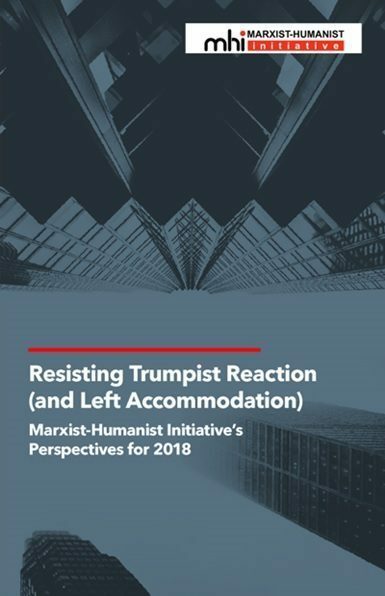 Such “analyses” are reminiscent of the one produced by the leadership of the so-called International Marxist-Humanist Organization in its effort to avoid explaining why News and Letters Committees degenerated and abandoned Marxist-Humanism.